28 November 2017, at 12:00a.m. Are poultry red mites as indestructible as they seem? We asked the experts for some advice on how to control these elusive bloodsuckers, writes Melanie Epp. Poultry red mite is the most devastating parasite of laying hens, not only in Europe, but worldwide. Research shows that the pest increases rates of anemia, mortality and disease susceptibility while negatively impacting both feed efficiency and poultry welfare. In Europe alone, it is estimated that red mite infestations cost poultry producers €360 million a year, with more than 300 million hens in all types of production suffering from infestations. Two red mite specialists shared their expertise at the 2017 International Egg Commission Global Leadership Conference. 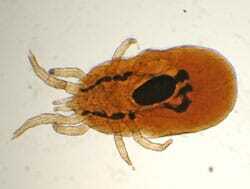 Poultry red mite was first described in 1778. The mite is an active night bloodsucker of the spider family. During the day, the pest hides itself, making it difficult to find them in the barn. Around the world, most poultry farmers are well aware of red mite and its impact on production – all but those in North America. "The bad news is that there are first reports that the poultry red mite has also arrived in North America," says Farhad Mozafar of German poultry breeder Lohmann Tierzucht. "And I think, unfortunately, in some years this will also be a challenge for our friends there." The trouble with red mite is that it prefers high temperatures and high humidity – and that it multiplies quickly, as the pest completes its life cycle in just six to seven days. "This is the reason why on hot summer days we can see an explosion of the population of red mite on poultry farms," explains Mozafar. "If the problem is really big it means that the population was already there." Another difficulty is that they’re easily transported from one farm to another. "You can get it from anything, including the rearing farm, visitors, livestock and rodents," says Mozafar. "Even humans can be vectors." "After that, we will see that if they are inside it’s not easy to get rid of them," he continues. "Or actually impossible." Red mite infestations negatively impact both egg production and hen welfare. The pest causes restlessness and stress in the flock, leaving the birds very uncomfortable. During the night they bite the hens, causing skin irritation, dermatitis and reduced feather quality. Mozafar said that in some cases this leads to increased feather pecking and even cannibalism. Other consequences include weight loss, lowered feed conversion and decreased egg production – sometimes by 20 per cent or more – as well as immune suppression. Infestations can even lead to death. "We know that red mites feed on 200 micrograms of blood every time it goes on a hen," says Mozafar. "If you have 5,000 red mites on one single bird, they’re taking 1g per day from the bird. If this is 50,000, it will be 10g and if it is 500,000 mites on one bird it will be 100g. "One bird has about 130g to 140g of blood, so you can imagine a very serious infestation, in just some days, can lead to death," he says. Research shows that in a very severe infestation, up to 500,000 mites could attack a single bird in one night. Another important consequence of mite infestations is the carry-over of poultry diseases. "It’s actually proved that almost all poultry diseases can be carried over by red mite," said Mozafar. "We even have new reports that avian influenza can be carried over." A study conducted at Wageningen University in the Netherlands comparing a flock without red mite to flocks with moderate, considerable and severe infestations found that feed consumption was greatly impacted by the presence of mites. "If you look at feed consumption, it could be about 108g in a flock without red mite infestation," says Mozafar. "But if you have infestation, the birds, on average, eat two grams more." Egg weight is also negatively impacted with eggs, on average, weighing 1g less where infestation occurs. Researchers at Wageningen University have calculated there were €130 million losses per year in Europe in 2005 and 2006 due to red mite, which was almost, at that time, 50 cents per hen per year. In a similar study at Lohmann, Mozafar found that a moderate infestation led to a 27-cent loss, on average. Considerable infestations, he said, led to a loss of 57 cents. "And for the high infestation it’s unbelievable," he says. "We calculated it at €2.50." Why is red mite so hard to control? Longer laying cycles and the fact that red mite can hide in just about anything has created a uncontrollable situation. Even during treatment, mites seem smart enough to hide themselves, only coming out when the treatment is no longer effective. Another challenge is that they can survive a very long time without eating. "These mites can stay up to one year without having a single blood meal," explains Mozafar. "They can also tolerate unbelievable temperatures – up to 45°C and as low as -25°C." He adds: "This is the reason that the poultry farm remains infested with the mite even when there is no poultry inside." Perhaps one of the biggest challenges, though, is the fact that red mite build up resistance to pesticides in a very short time. This resistance is accelerated where incorrect treatments have been used or where the same product has been used over and over. Changes in legislation, especially in Europe where everyday products like fipronil are banned, makes red mite even more difficult to eradicate. Is control of red mite possible? While some believe that control of red mite is nearly impossible, Dr Monique Mul, professor and researcher at Wageningen University, believes that prevention, suppression and constant monitoring will lead to greater control. The first step is prevention and suppression. Between the laying cycles, Mul suggests cleaning the barn. "Clean as well as possible," she advises. "Get rid of all the mites that you can because you can do whatever you want when there are no hens in it." Next, get rid of all hard manure because mites hide under it. Also, get rid of dust. "If you get rid of the dust you also get rid of the mites," says Mul. During the laying cycle, it’s important to monitor all possible points of entry for mites. "They come in with crates, they come in with employees and visitors," she says. "The mites come in with the egg containers and pallets, and they come in with egg trays." Poultry red mite is present in the whole poultry egg production chain. It’s important to be aware of possible spread between the links. "Clean what you take in and what you take out," says Mul. What can you do to avoid an increase in red mite when you notice first signs of their arrival during the monitoring stage? Suppression methods, said Mul, include removing manure and dust daily. She suggests applying liquid silica to suppress the population by killing some of the mites. You can also use plant-derived products and essential oils to do the same. "You can apply predatory mites or a Q-perch," she adds. "Is red mite controllable?" ponders Mul. "Yes, but it will require awareness, monitoring, action and research."